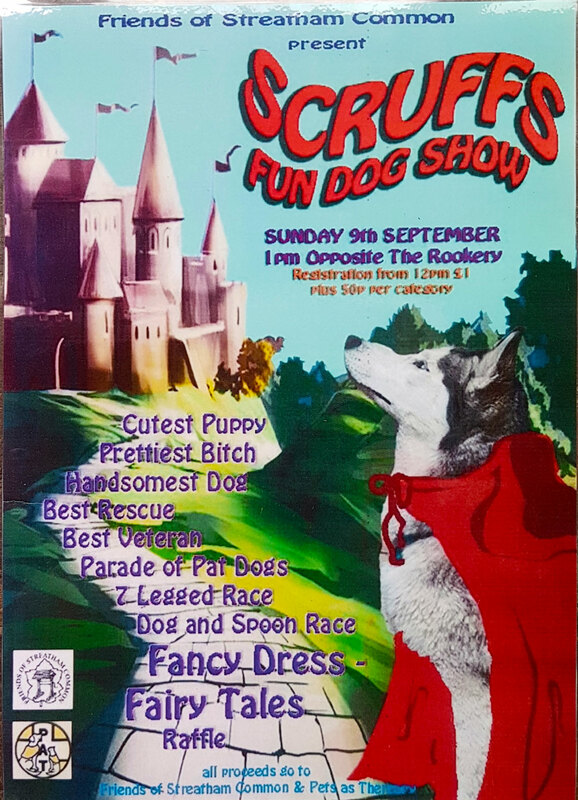 Friends of Streatham Common are hosting ‘Scruffs’ Fun Dog Show on Streatham Common. Registration opens 12pm and costs £1. All proceeds go to Friends of Streatham Common and Pets Therapy. John Rhodes has run the dog show for 20 years now. He has worked tirelessly for both Pets as therapy and the FoSC. Lets give him some payback this year. We need volunteers. So any dog lovers out there. please let us know ASAP! This years theme is fairy tales, so all those little red riding hoods,, goldilocks and humpty dumptys can show themselves! The annual fun show for dogs of any age, shape or size, now in its 20th year! On the Common opposite the cafe. From 12.00 until 5.00pm. TURNS UP AT MY YAHOO ADDRESS! Found it disappointing that after saying the theme was ‘Fairytale’ for Fancy Dress – 3rd placed was a pink lady from Grease – that’s a film not a fairytale. No point stating a theme if the judges aren’t going to take note!